I measured the LCD2 Closed-Backs using a G.R.A.S. Model 43AG ear/cheek simulator/RA0402 ear simulator with KB5000/KB5001 simulated pinnae, a Clio 10 FW audio analyzer, a laptop computer running TrueRTA software with an M-Audio MobilePre USB audio interface, and a Musical Fidelity V-CAN amp, with an Audio-gd NFB-1AMP used for distortion measurements. These are “flat” measurements; no diffuse-field or free-field compensation curve was employed. 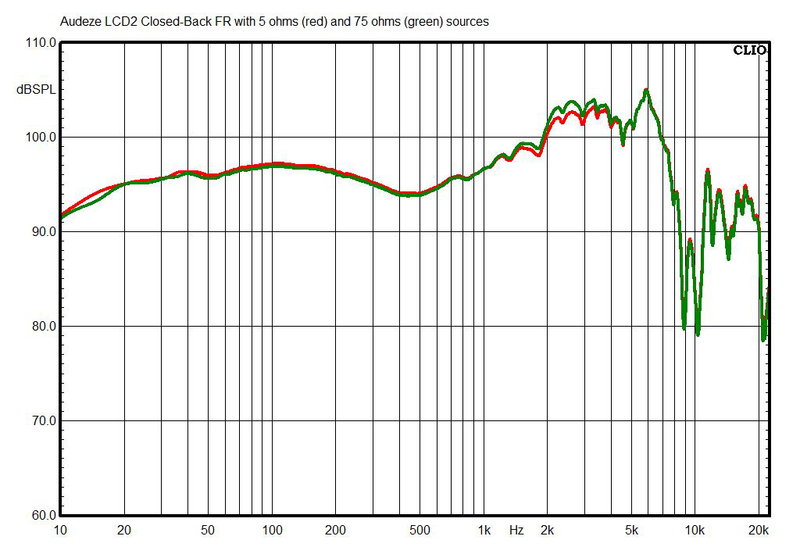 The above chart shows the LCD2 Closed-Backs’ frequency response. 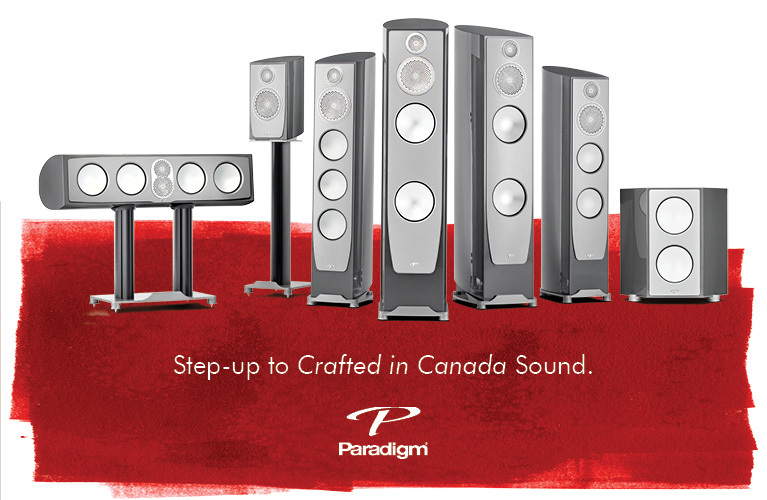 This is a typical measurement for audiophile-oriented headphones, with maybe just a dB or two more bass than many large planar-magnetic models offer. 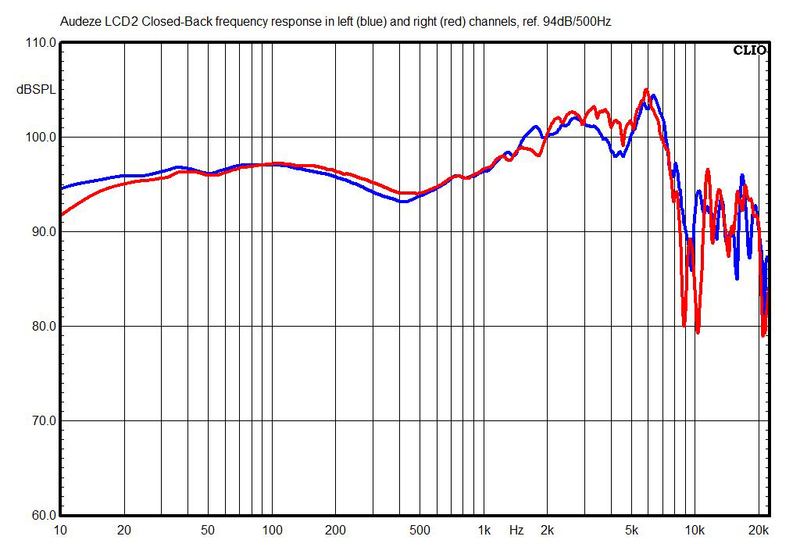 This chart shows how the LCD2 Closed-Backs’ tonal balance changes when they’re used with a high-impedance source, such as a cheap laptop or some cheap professional headphone amps. 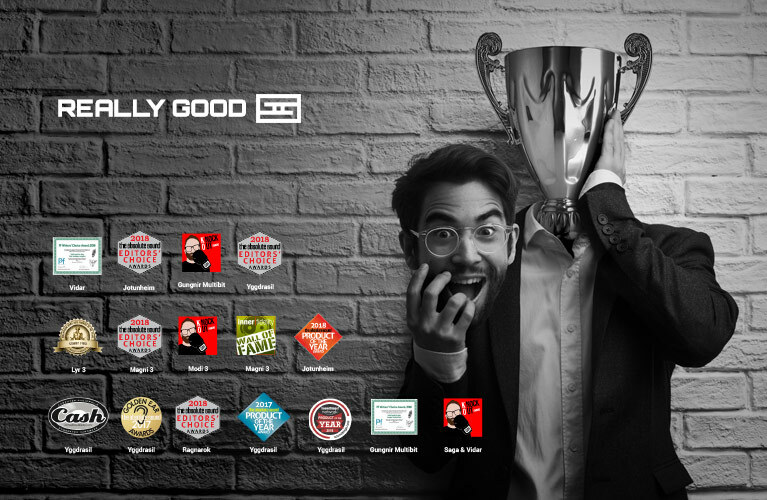 This is a little surprising, because most planar-magnetic headphones show no variance on this test. 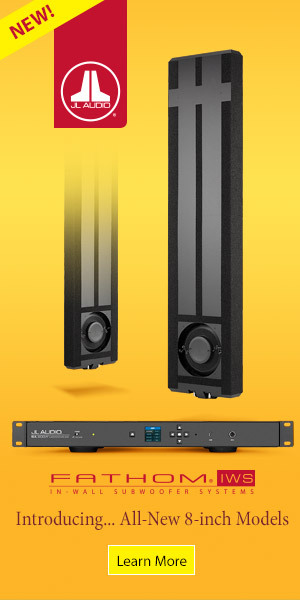 With the LCD2 Closed-Backs, the higher-impedance source produces a boost of 1 to 1.5dB between 1.5 and 3kHz. 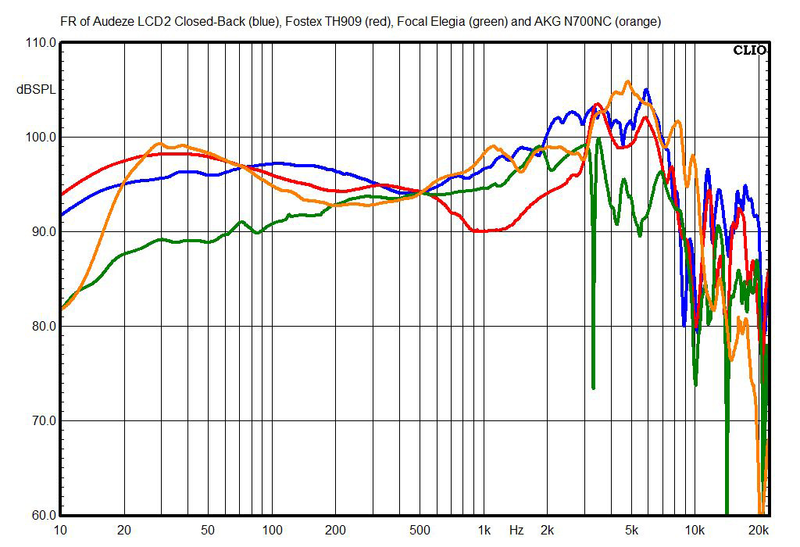 This chart shows the LCD2 Closed-Backs’ right-channel response compared with two other audiophile-oriented headphones (the Fostex TH909s and Focal Elegias), as well as the AKG N700NCs, a new closed-back model said to deliver response very close to the “Harman curve,” shown in research by Harman International to be the preferred over-ear headphone response for most listeners. The LCD2 Closed-Backs are clearly in the ballpark of a “standard” headphone response, with perhaps a little more treble and a slightly fuller midrange than we see in most over-ear headphones. 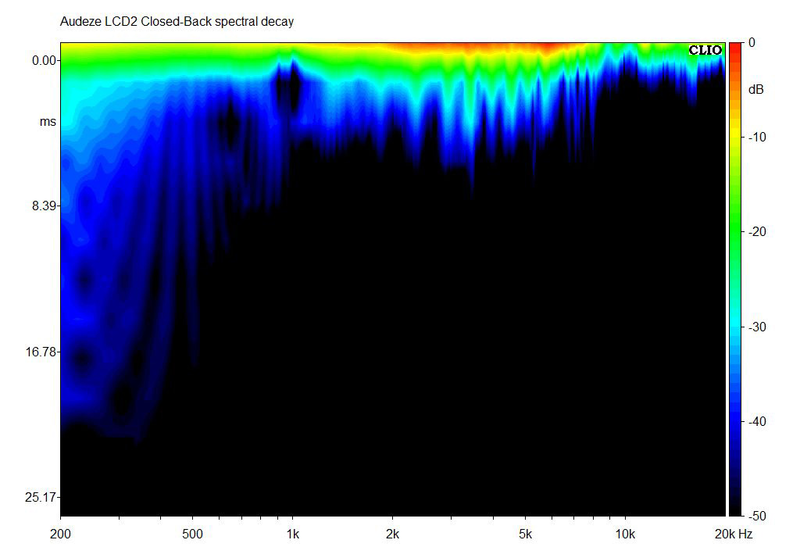 The LCD2 Closed-Backs’ spectral decay (waterfall) chart shows slight comb filtering effects between 2 and 6kHz that are commonly seen in planar-magnetic headphones, but they’re far better-damped than usual, probably because of the closed back and perhaps some damping material inside. 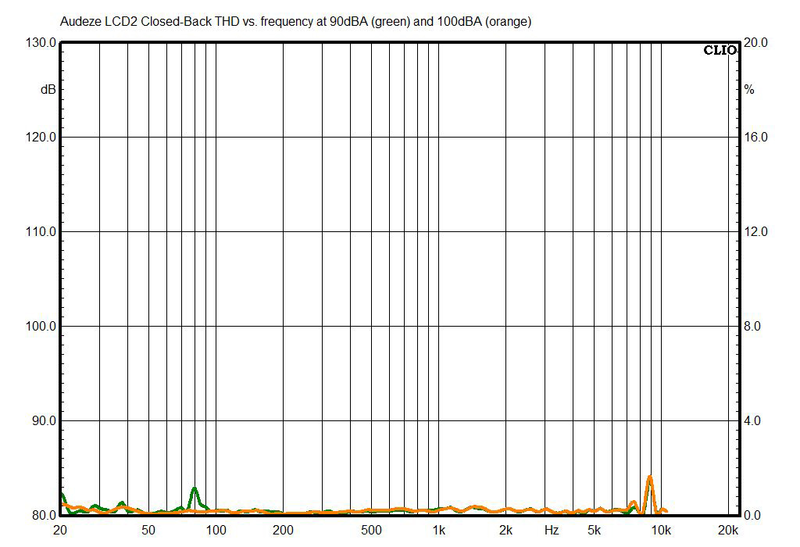 Measured total harmonic distortion (THD) of the LCD2 Closed-Backs is near zero, barely above the noise floor of the measurement. In this chart, the external noise level is 85dB SPL, and numbers below that indicate the degree of attenuation of outside sounds. 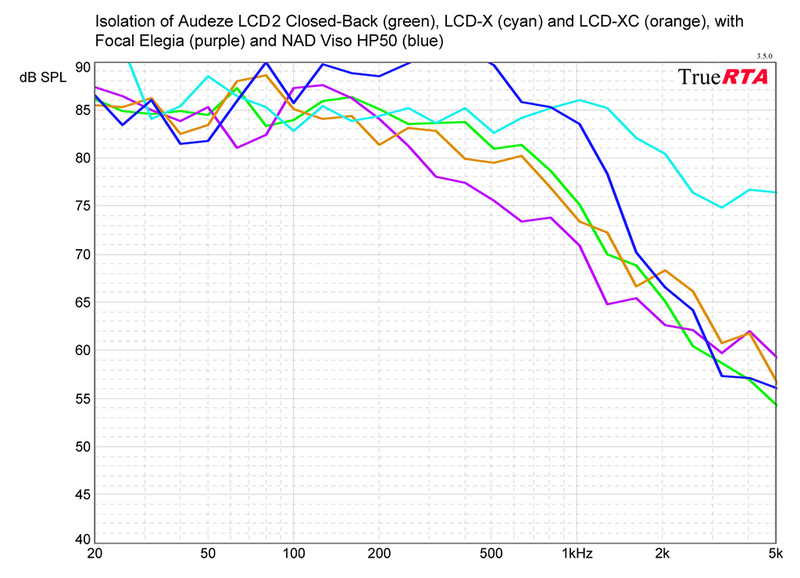 The LCD2 Closed-Backs’ isolation is about average for headphones of this type, and notably better than a conventional, smaller set of closed-back headphones such as the NAD Viso HP50s (also shown) -- and, of course, better than Audeze’s open-back models. Here’s an unusual result -- most planar-magnetic models have a dead-flat impedance curve, but the LCD2 Closed-Backs’ impedance response has a large peak of 108 ohms, centered at 2.4kHz; through most of its range, the impedance magnitude is flat at 72 ohms. Despite the fairly large magnitude swing, the phase response shows just a mild shift at the same frequency. 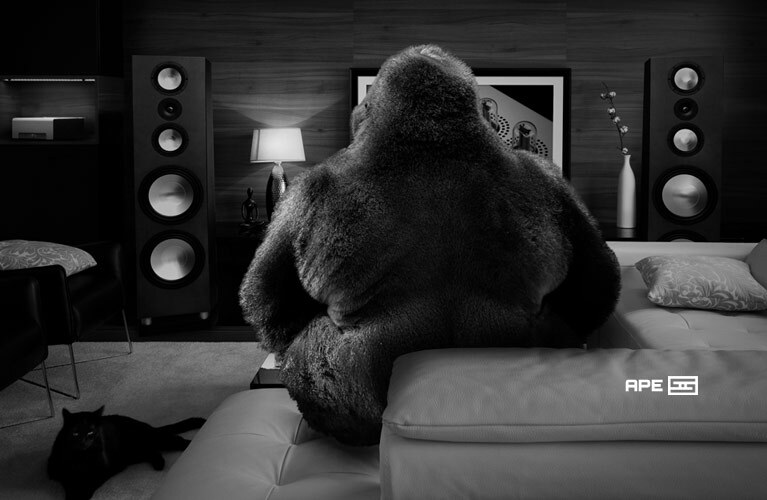 This peak is why the response of the headphones changes when they’re used with a high-impedance source. 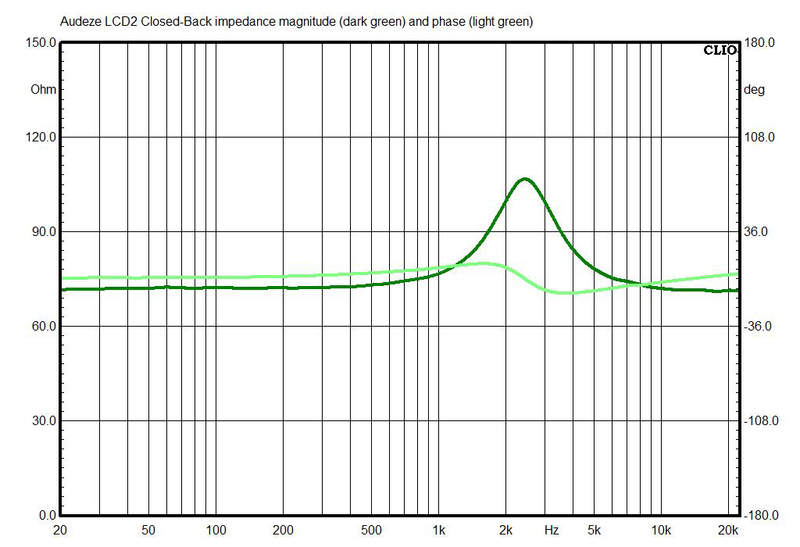 Sensitivity of the LCD2 Closed-Backs, measured between 300Hz and 3kHz, using a 1mW signal calculated for 70 ohms rated impedance, is 97.5dB (the rating is 97dB). 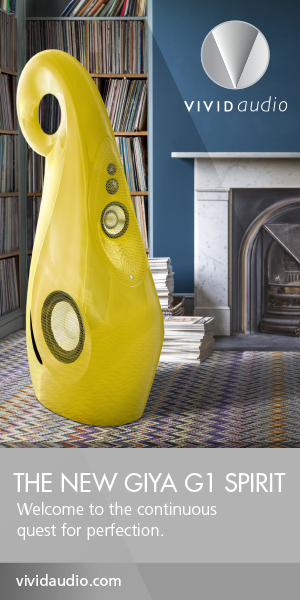 That’s high enough that you’ll get a somewhat usable volume from typical smartphones, but low enough that you’ll want to use a high-quality portable music player or amplifier for most of your listening.